Have you ever struggled with the brightness of light in your bathroom? Maybe it is too dark when you want to put on makeup or grooming, or it is too bright when you have to use the bathroom middle of the night. On top of that, you have to balance the paradox of privacy and natural lights. And funny enough, you don’t seem to encounter any of these problems in high-end hotels. The answer is ensuring the distribution of light is located at the essential spot of the bathroom, to ultimately achieve optimal brightness. I know, it is a bit Einstein-que. The best possible and most essential type of lighting in the bathroom is lighting from the sides of the mirror. This leaves no part of the face in the shadow, as happens with an overhead fixture. I highly recommend a quality LED lighted mirror to achieve this, as the mirror emits an even amount of light around you. This makes it even easier to apply makeup, shave, or style your hair without the overhead shadow that downlighting can so often create. Nowadays LED lighted mirrors also come with an in-built demister. Not only can you get optimal lighting for activities in front of the bathroom mirror, you can also experience a clear reflection from the moment you exit your shower. Say goodbye to foggy mirrors! 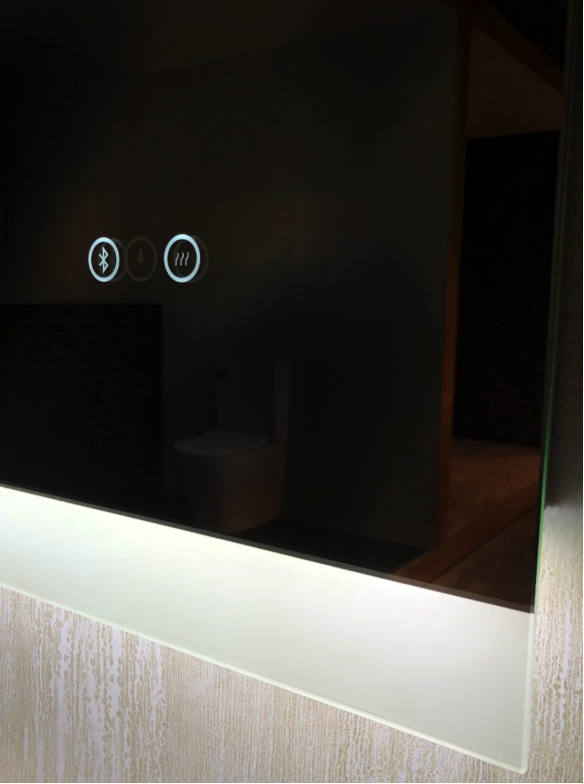 On top of that, the ambience that the LED lighted mirror creates elevates the bathroom finishes to the next level, creating that sense of ‘hotel luxury’ without breaking the bank. Bathrooms are sometimes used in the middle of the night. Thus, it is essential to provide some light – not too much, but enough to ensure it is safe to manoeuvre. On the other hand, bright overhead lights can be blinding and disruptive, and trust me, this then causes many sleepless nights. Therefore, it is a good idea to have a low wattage fixture with a masked light source in the bathroom. You can see that many high-end hotels sometimes feature LED lighting below the vanity, countertop or mirror so that it gives some directive lights. Better lighting has also been shown to help prevent falls among seniors. 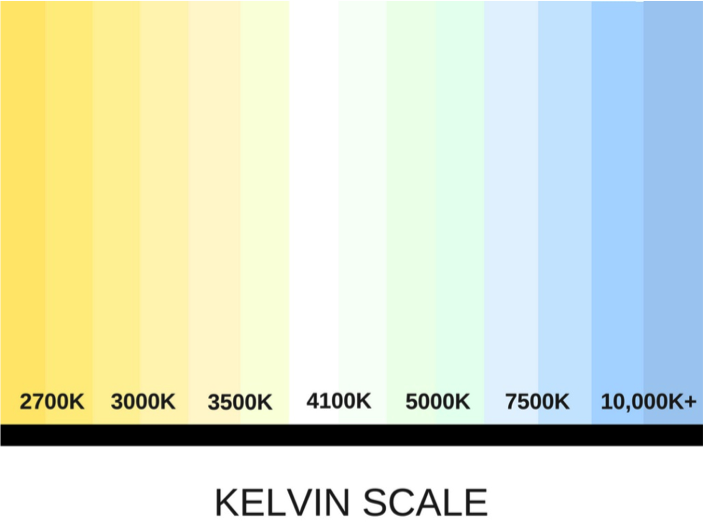 The temperature of light is measured on the Kelvin scale. There are three main groups that the LED lighting is classified in; Warm White, Daylight and Cool White. For the majority of people, LED lights on the warmer end of the spectrum (2700K-3000K) would be more preferable. This is a common misconception, as having ‘daylight’ LED lighting (around 4100K on the Kelvin Scale) actually gives you the clearest and best lighting, especially on the face. Warm white is great for bigger living spaces where you would like to give the room the ambiance of warmth, and an inviting sense. However, for bathrooms where you want the space to look and feel clean, there has been lengthy research conducted that says ‘daylight’ LED lighting is in fact a better choice. According to Doug Walter of Doug Walter Architects in Denver, daylight LED lighting (3500-4100K) – especially in the short wavelength blue range (460-525 nanometers) – has been shown to help set proper circadian rhythms. Having disrupted circadian rhythms has been tied to heart disease, high blood pressure, diabetes, cancer and obesity. In terms of makeup application, sticking with a ‘daylight’ or ‘cool white’ LED lit mirror is key for an even application. ‘Warm white’ can make the face appear more yellow than it truly is, resulting in a patchy or too heavy make-up application. Most makeup artists have now invested in what is called an ‘LED Ring Light’, which is essentially a ring of LED globes that are between 5500K – 6500K on the Kelvin scale. This is used because it mimics daylight for an even makeup application, and it also helps you take better selfies may I add! Ultimately, lighting is by far one of the most important things to maximise in your bathroom space. If you plan to spend big on your bathroom build or renovation (which majority of the time is a yes) then LED lighting in your bathroom is highly recommended. Don’t spend big and then wish you could make changes, such as getting rid of those shadows cast across your face or having a mirror that never fogs up! Do it now, budget it in, and get the bathroom of your dreams that you won’t ever want to change.